A spycop sexually abused a woman for two years. But new documents reveal his cover officer is claiming ignorance. On 3 October, undercover policing was back in the courts. Kate Wilson, who was deceived into a sexual relationship with Mark Kennedy, was at the Investigatory Powers Tribunal for a hearing over her case that Kennedy abused her human rights. Part of the evidence Wilson is demanding is disclosure of how far up the chain of command knowledge of her relationship with Kennedy went. During the hearing, one of the tribunal panel members stated it was “inconceivable” that Kennedy’s supervisors didn’t know about his relationship. 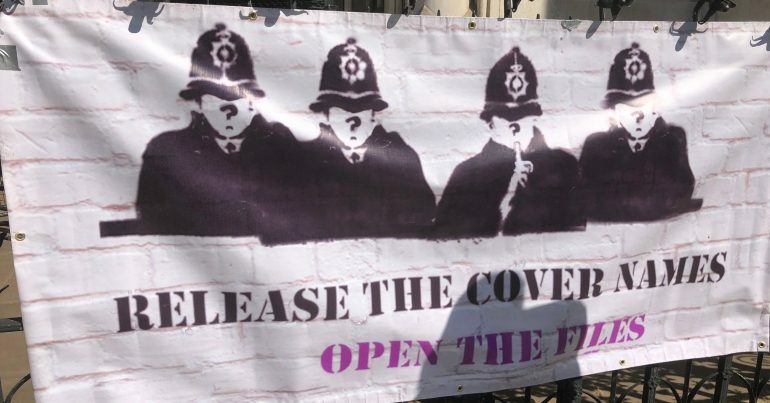 But this statement comes just a day after a document published on the Undercover Policing Inquiry’s website claimed that at a cover officer had no knowledge of the sexual relationships one of her officers engaged in. day-to-day responsibility for dealing with the UCO [undercover police officer] and their security and welfare. One such cover officer is N30, whose risk assessment was published by the UCPI on 2 October. N30 was responsible for nine UCOs between 2004 and 2008. One of these officers was N104, Carlo Neri. Neri had a two-year relationship with a woman known as Andrea and even proposed to her. N30 stated that no one to her knowledge was involved in a sexual relationship during her tenure. He kind of made an effort to be in contact with them a lot … and they reciprocated because they liked him. And yet the woman who had day-to-day responsibility for his actions claims to have no knowledge of the relationship. Speaking to The Canary, Andrea agreed with the assessment of the tribunal that it was “inconceivable” that Neri’s cover officers and managers did not know about the relationship. She described what happened as “systematic, state-sponsored abuse”. In light of the revelation that one of Carlo’s key cover officers was a woman, I now question who the woman on the phone was… it clearly wasn’t his sister. Wilson, Andrea and everyone spied on needs full disclosure of police documents. And this has to include information about cover officers, line managers and however high up the policing hierarchy this abuse goes. It is clear that the victims of undercover policing cannot trust the selective information given to them by the police. Nothing justifies what the police have done to political campaigners and they need to come clean. These officers, their managers and whoever else knew about their actions need to be held to account. Enough is enough. The Canary contacted the Metropolitan Police for comment but had received no response by the time of publication. – Find out more and support Police Spies Out Of Our Lives. – Check out Undercover Research Group and Campaign Opposing Police Surveillance. A former police spy has said senior officers should hang their heads in shame for their “scandalous” conduct after they disclosed that she helped protesters to release thousands of mink into the New Forest. 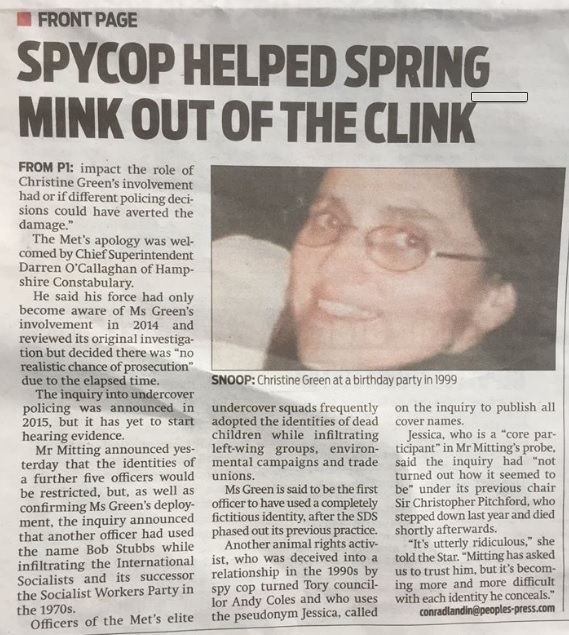 The Metropolitan police revealed on Tuesday that the undercover officer, who used the fake identity of Christine Green, had taken part in a raid that released as many as 6,000 mink from a farm while she was pretending to be an animal rights activist. Green has now come forward and criticised the Met for naming her while concealing the identities of the senior officers who had authorised her to take part in the raid. “That seems like double standards to me,” she said. Green described how she has had a “great deal of therapy and counselling over the years” for the mental health problems caused by her covert work. Green spent five years as a member of the Met’s covert unit, the special demonstration squad (SDS) in the 1990s, pretending to be an animal rights activist. Her deployment was revealed on Sunday after investigations by the Guardian and campaigners. Since quitting the Met in 2000, she has had an intimate relationship with one of the prominent animal rights activists she had been sent to monitor. They have lived in remote cottages in Cornwall and Scotland. She added that her “duplicity, whilst doing my job to the best of my ability, has had a long-term damaging effect on my physical and mental health”. 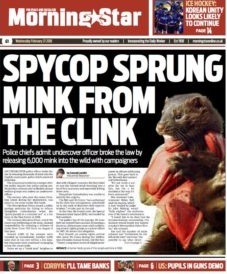 The Met revealed on Tuesday that Green had taken part in the Animal Liberation Front raid that released the mink from a farm in Hampshire in 1998. The raid caused problems in the New Forest as residents and farmers struggled to prevent the animals killing pets and livestock. The Met publicly apologised to Hampshire police for concealing Green’s involvement in the raid and its knowledge of the culprits from them. Hampshire detectives conducted a criminal investigation, but did not charged anyone. In its apology, the Met did not disclose the identities of Green’s superiors who had authorised her to “participate in a criminal act”, other than to say that the decision could have potentially gone as high as the rank of detective chief superintendent. Green said she had not acted as an agent provocateur during the raid. “My role at the time, which was consistent with my understanding of the aim of the SDS, was not to entrap any individual or gather evidence to bring about a prosecution, but to gather intelligence over a longer period of time, so that those planning or undertaking serious criminal activities could be thwarted,” she said. The Met had not commented by the time of publication. More Spycops Named, But WhoWas Spied On?